The most touching moment I experienced working on a wedding was when my 2018 bride Jess wanted to wait until both her hair and makeup were completed before looking in the mirror. When she finally saw herself she was overwhelmed with tears of joy, she could not believe how beautiful she looked and felt. It was such a rewarding moment! Where do I even start? When I met you for my wedding makeup trial I knew I’d chosen well. You have such an approachable personality that made us feel like you were just one of the girls 🙂 When the big day came along you were a true professional and perfectionist (which made this fellow perfectionist very happy) and made us feel so relaxed. The makeup was absolutely flawless and lasted even when we were all dripping in sweat from dancing at the reception. Thank you so much on behalf of myself, our mothers and bridal party. Kate is amazing at what she does. The quality makeup received is well worth the money spent. She is a lovely person who made me feel completely at ease and I had full confidence in her as my makeup artist. 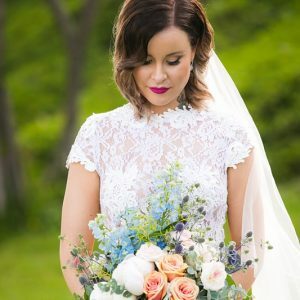 I felt perfect for my special day, and so did my girls and my Mum. Kate provides a flawless look and easily smashed out myself, 5 bridesmaids and mother of the bride in record timing. Such a talented, genuinely lovely woman! Can’t recommend her enough! 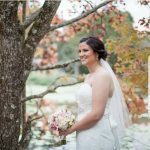 I just wanted to send a quick email to thank you for making me beautiful on my wedding day. My makeup lasted all night and was so stunning, yet somehow still felt natural. You are amazing. In fact, all of the girls looked incredible and absolutely loved your work. We wish we could do it all over again! I wish you all the best with your business – I will be sure to pass your details onto anyone and everyone! I will also send you some photos from the photographer once we get them.